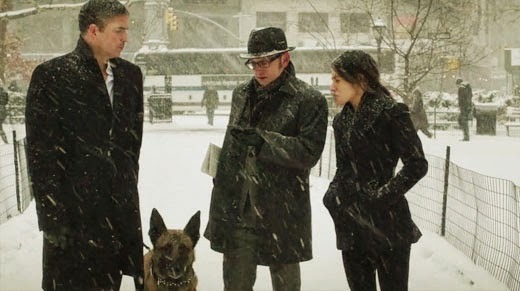 Samantha "Root" Groves has had a complex journey on 'Person of Interest'. She began her time on the series as a mysterious antagonist with hacking skills that could rival Harold's own, but along the way her character's significance grew as did her bond with the Machine. Now she's on a holy mission from her God to prevent the rise of Samaritan II--a new supercomputer which would spell doom for many. In "/" (Root Path), the Machine leads Root on a path that forces her to come to terms with the sins of her past. There's a moment where Root is forced to deal with feelings of guilt and remorse as she talks with Harold about how he built the Machine. She curses him for 'breaking' her by having her care about people while Harold rebuffs that assertion with the pure and simple fact that the Machine's empathy toward people is what makes her so effective. For all her posturing and deflecting that she's just not programmed like the rest of 'them'--seeing her undergo painful medical procedures with little or no anesthetic and barely flinching for example--we know that Samantha Groves is trying to emulate the cold calculated nature of the computers she grew up with. Her actions in the beginning of the episode with Billy (guest star Colin Donnell) were as she aspired to be before. The Machine could humor this side of Root's personality as Billy really was a pure means to an end. Throughout their scene, Root was guided by the hand of her God and she could follow a plan she didn't know the endpoint of. There was always a connection to tether her actions no matter how random they may have seemed on their own. But then the Machine deems that her path should collide (again) with Cyrus Wells. A man she met years back as a feckless hacker/gun for hire who took any job as long as the pay was right. She wounded Cyrus back then as well as killed two of his co-workers and it shook him deeply to the core in a way that made him change his entire life. Going from millionaire to night janitor but gaining the idea of everything being part of a plan he couldn't see. Root may scoff at that notion but she's doing the exact same thing by listening to the buzzing in her mind as the Machine leads her. And there are moments in this part of her journey where Root is separated from her guide that test her mettle as she strives to figure out the objective of her mission and complete it. I'm glad that Root didn't think she was being punished by choosing the person over the computer chip as she walked directly into the line of fire to save Cyrus Wells from Decima operatives. The bullet she took was just another way she's bled for her beliefs since her connection with the Machine took hold. actively targeting not only Vigilance but every member of our beloved team. Though Root may deny the value of caring about people so much, she couldn't have kept Cyrus Wells alive and redeemed a sin from her past without the assistance of John Reese, Detective Fusco, or Shaw. Samaritan II represents Root's former ideal of an all-knowing, all-seeing machine with zero empathy for anything that gets in the way of achieving its objectives. Now that she's had her religious awakening and is walking the path of the righteous, at least in this war she's considered one of the good guys despite her methods, she will require cooperation from any of the Machine's various assets in order to come out alive when the battle ends. We're about to see what it's like when two gods go to war and I can't wait to learn how the Machine Team's greatest challenge since H.R. will alter all of their destinies. Yeah we are in for one hell of a ride.